Sometimes when I indulge in over decadent foods I silently (or not so silently) reprimand myself for my lack of self-control. There are some foods though, that no matter how much I know I shouldn’t eat it, because I will have to work out like a maniac to counteract its influence on me, I still succumb to the temptation. I’m too weak around its presence, I’m captivated by the spell it casts, it truly is a dangerous love affair. One of those foods is brownies…..
I’m a sucker for a gooey brownie and if you are too you will love my Gooey Caramel Swirled Chocolate Brownies. There’s a double punch of chocolate in my recipe with chocolate chips and cocoa powder and to take these brownies over the top I’ve added yummy caramel swirls. Enjoy! Once caramel and brownie batter are prepared pour 3/4 brownie mixture into prepared baking dish then pour caramel over the top. 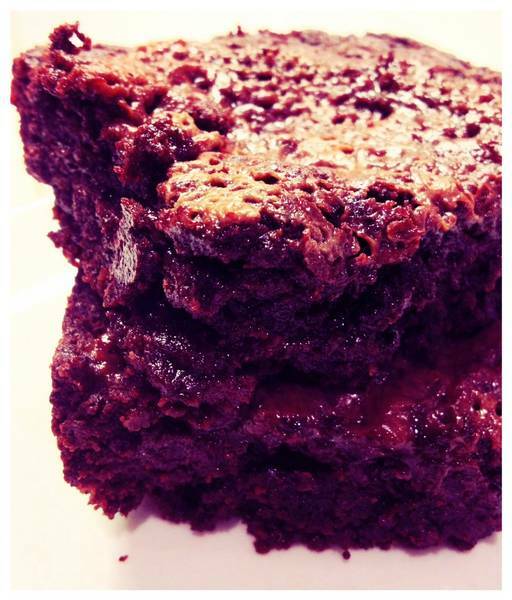 Finish with dollops of the rest of the brownie mixture then with a knife swirl and smooth to create an even brownie. Do not swirl too much or else the caramel will incorporate completely into the batter and the beautiful swirls will not be evident after baking. Bake for 3-35 minutes or until toothpick inserted into the middle of the brownies comes out clean. Allow to cool for at least 30 minutes before cutting into.